The new Havana cases — along with what Secretary of State Mike Pompeo called the “very similar and entirely consistent” medical problems of a young consular official in China — stoked fears that American envoys were now being targeted by a mysterious, high-tech enemy acting on a global scale. A sprawling investigation has enlisted law enforcement agents, intelligence officers and defense experts, as well as scientists and medical specialists from within and outside government. Analysts have combed through secret communications intercepts, and technologists have tried to reverse-engineer weapons that could produce the effects diplomats reported. Yet after more than 18 months of work, the investigators have been unable to answer basic questions about every major aspect of the case, many officials said. The episode in Havana last May remains as unexplained as everything that came before it. When FBI agents inspected the young woman’s home in early June, officials said, they found nothing to contradict the Cuban investigators who had traced the noise she reported to a faulty water pump. Nor could the agents reconcile that explanation with the findings of doctors who eventually linked her diagnosis to the earlier Havana cases. New details of how the incidents unfolded and the government’s response — gathered from dozens of interviews with former Havana diplomats, national security officials and others — suggest that key Trump administration officials locked on almost immediately to the belief that the diplomats were being attacked by some covert enemy. Their suspicions of Cuban involvement, stirred by early CIA assessments, then hardened even as questions about the Havana episode multiplied. The Cuban government has vehemently denied having anything to do with the diplomats’ injuries. Clinging to what remains of the Obama administration’s historic rapprochement, Communist Party leader Raúl Castro and other Cuban officials have promised to help however they can. As tensions have escalated, however, Cuban officials have also demanded that Washington stop talking about “attacks” that it cannot prove. The Trump administration’s continued insistence that Americans were attacked has led to remarkable divisions within the government. In classified briefings, the CIA has pointed to both Cuba and Russia as likely suspects, possibly as part of an attempt to collect intelligence with antiquated or faulty equipment, officials said. The FBI has steadfastly refused to even use the term “attacks,” because its agents have yet to find evidence that the injuries were caused by hostile actors. The White House, along with Cuban-American leaders in Congress, has only pounded harder at presumed Cuban involvement. Although some State Department and National Security Council staff aides pushed back against those claims last year, most of those officials have been replaced with others more in line with the administration’s views, people familiar with the internal debate said. 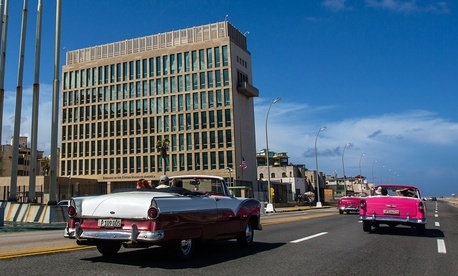 The rift has also reverberated among the diplomats and spies who served at the U.S. Embassy in Havana when the incidents took place. Among the afflicted personnel, there seem to be few, if any, who are not convinced they were victims of an attack. Others, while sympathizing with their colleagues’ suffering, suspect that the stress of service in Cuba or unrelated medical issues may have also played a role in some cases. The symptoms of the Americans who served in Cuba are, by all accounts, real. Of some 150 U.S. diplomats, intelligence officers and family members who sought medical attention, doctors at the University of Pennsylvania later tested 10 men and 11 women and found them to have “widespread brain network dysfunction” resulting in cognitive, balance and eye-movement problems. Most of the patients suffered from common problems like dizziness, fatigue and difficulties with recall or concentration. A smaller group had more unusual impairments, including three cases of partial, one-sided hearing loss. Although the severity of their symptoms varied widely, the Penn doctors saw a pattern like that of a mild traumatic brain injury, but with no sign of trauma — “a concussion without a concussion,” one called it. But from the moment last February that the Penn doctors published their study of the Havana cohort in the Journal of the American Medical Association, questions have been raised about other possible causes — and whether a State Department-led task force established by Pompeo is doing enough to explore them. Among the alternative explanations being considered by the medical team is whether some of the patients might have suffered a functional neurologic disorder, possibly triggered by trauma or stress, which could impair their balance, movement, vision or other areas. At the end of December 2016 — little more than a month after Donald Trump was elected with a promise to end Barack Obama’s opening to Cuba and weeks after the death of Cuban leader Fidel Castro — a CIA officer in his 30s went into the medical clinic at the U.S. Embassy in Havana. The officer, who worked under diplomatic cover, told the nurse he was feeling sick after hearing a strange, high-pitched noise in his home at night, officials said. Two other CIA employees soon reported having had similar experiences and also feeling ill. Some described something like a beam of sound, pointed into their rooms, sometimes accompanied by an undulating pressure. Some officials reported that the noise stopped when a door was opened. The suspicious fact that CIA officers seemed to have been struck first and disproportionately by the strange sounds and illnesses — at least four people connected to the small Havana station reported symptoms, as well as a CIA employee who came to the island on temporary duty later on — led agency officials to assume that the incidents were some kind of harassment or electronic-monitoring effort directed at intelligence officers, officials said. Based on the agency’s theory that the officers had possibly been hit by some kind of sonic weapon, government doctors turned to an ear, nose and throat specialist at the University of Miami’s Miller School of Medicine who had previously treated brain-injured soldiers in Iraq as a Navy physician. Back in Havana, senior U.S. diplomats belatedly disclosed the incidents to the diplomatic staff in late March 2017, leaving many of them upset that information about a possible danger to their families had been withheld. Embassy personnel were advised to be on guard for any strange sounds, and to move quickly away — “get off the X,” as the security officials put it — if they heard anything. In the weeks that followed, more than 130 embassy employees and their family members sought medical attention, out of a community that included only about 53 diplomats, some of whom were single or unaccompanied. Of those, 35 were flown to Miami for further evaluation. Although Hoffer has contended that his diagnoses were more “pure,” in that they were undistorted by media attention that began in August 2017, diplomats who served in Havana at the time said there was widespread concern about the dangers, and an almost palpable fear among a smaller group of the embassy staff. The pace of the reported incidents and positive diagnoses picked up in April and May of 2017, as the embassy staff crowded into a secure conference room for frequent updates on the situation. One diplomat who had been hearing what he thought were insects in his garden listened to an intelligence officer’s tape recording of the suspect noise and felt sure it was the same sound. Both the diplomat and his wife, who had not previously felt ill but were under unusual stress, were diagnosed in Miami as having been affected, officials said. Soon thereafter, the same diplomat warned his Havana neighbor, a Canadian diplomat who had also been hearing the cicadalike noise in his garden at night. That diplomat and his family then left Cuba as well. It was later confirmed that a member of that diplomat’s family was the first of the 10 Canadian cases that would be diagnosed. By contrast to the State Department, the Canadian Foreign Ministry took a skeptical approach, avoiding any discussion of attacks and emphasizing that it had no reason to suspect Cuban involvement. But, after returning to Canada, some of those who had reported feeling ill (including two children) sought treatment on their own at the University of Pennsylvania. Although only two of the Canadians had said they heard anything like the strange noises reported by the American diplomats, some of the 10 were found to have similar symptoms, officials said. Thereafter, Canada stopped sending families to Havana and joined the U.S. task force as an observer. At the U.S. Embassy, diplomats began to report a variety of sometimes frightening experiences: At least two patients heard long, shrill sounds in their garden for hours at a stretch. An experienced, middle-aged official thought she was suffering migraine headaches after a strange incident in her home, which was followed by a painful sensitivity to light. A younger diplomat was suddenly hit with a high-pitched, undulating noise that almost seemed to paralyze him as he lay in bed on a high floor of a busy Havana hotel, the Capri, in a room overlooking the sea. A government doctor on temporary duty in Cuba then reported a similar incident in the same hotel. Those who did become sick represented a fairly wide cross-section of the staff, from older women who had suffered past medical problems to at least three younger, athletic men. (The average age of the male patients was 39, the women, 47.) An experienced security officer assigned to deal with the problem was also among those affected, officials said. Within weeks, it began to emerge that the diplomats’ symptoms did not follow the typical pattern for mild concussions. Rather than being most pronounced after the initial injury and then receding over a few weeks or months, their cognitive and balance symptoms often began to appear days after the presumed exposure, and sometimes grew worse weeks or months later. With sometimes conflicting information from different doctors, the State Department’s medical bureau has determined which diplomats are “medically confirmed” as having been injured. Several of those affected complained that the bureau seemed especially concerned with getting them off of medevac status after they left Havana, which required the department to pay per diem expenses. The diplomats also complained that the department was slow to arrange further medical help. Over the course of 2017, CIA officials made the case for a probable attack in interagency meetings, briefings for other U.S. officials and briefings for foreign intelligence officials, often pointing to the Cuban security forces as suspects and sometimes suggesting possible Russian involvement as well. Pompeo, who was then the CIA director, was less skeptical, officials said. Stirred by the anger of some CIA officers and their fear of a continuing threat, Pompeo decided not to wait for further clarity. Although Cuba was still a hub of intelligence activity by Russia, North Korea and Venezuela, the work of the agency’s dwindling team in Havana was a considerably lower priority than it had once been. As the health incidents unfolded, the station’s acting chief was a young and inexperienced operative on his first posting abroad. Before midsummer, Pompeo ordered the Havana station shut down and its officers brought home. The logistically complex move was kept secret. But it reverberated powerfully in the broader U.S. policy toward Cuba, which had already begun to shift. In May, seeing the hand of the Cuban security services, the Trump administration expelled two Cuban diplomats who were thought to be intelligence officers working undercover. A few weeks later, the White House announced the first of several moves to roll back parts of the Obama administration’s opening and re-tighten travel and other restrictions. As then-Secretary of State Rex Tillerson considered options in the weeks that followed, he decided that if the CIA could not protect its spies, his diplomats were at least as vulnerable, officials said. Although more than 30 of the embassy’s diplomats and spouses signed a letter asking to be allowed to remain in Havana, he went ahead with drastic staffing cuts, which became permanent shortly before Tillerson was fired in March. The State Department’s pullout left just a skeleton staff on the island: From about 53 diplomats, the number dropped initially to fewer than a dozen before levelling off at about 15. The administration also forced Cuba to send home all but eight of the roughly 25 diplomats it had previously stationed to Washington. More recently, the Trump administration has moved from warning American travelers to a full-throated return to the rhetoric of the Cold War. In his Miami speech just before the midterm elections (with three Cuban-American Republicans running for House seats from South Florida) Bolton railed at a “Troika of Tyranny” and a “triangle of terror” between Cuba, Venezuela and Nicaragua. At an important moment of political transition in Cuba, with President Miguel Díaz-Canel taking over from Raúl Castro last April, U.S. intelligence reporting from the island has declined, officials said. The restrictions have also created hardships for Cubans who have long been of special concern to Cuban-American groups in the United States. Diplomats at the understaffed U.S. Embassy have had to scale back contacts with Cuban human rights activists, independent journalists and others, officials said, even as more hawkish officials under Bolton and Pompeo have challenged Cuban human rights policies more aggressively from Washington and at the United Nations. A decline in the flow of American tourists to Cuba has hurt small, family run restaurants and people who rent their apartments to tourists, often on Cuba’s growing Airbnb service. Cuban small businesses, which had been a priority for U.S. consular officials, have also been hampered by their proprietors’ inability to travel to the United States for supplies, a new report by the Congressional Research Service noted. Most significantly, the elimination of all but emergency consular services at the U.S. Embassy has led to a dramatic decline in the number of visas issued to Cubans who wish to travel to visit relatives or move permanently to the United States. Under a 1994 agreement that ended a flood of Cuban rafters into the Florida Straits, Washington promised to allow at least 20,000 Cuban immigrants into the United States each year, in addition to those sought by close relatives who are U.S. citizens. (The average number of Cubans admitted to the United States over the first 20 years of the agreement was more than 32,000 annually.) Through the first 10 months of the current fiscal year, only 3,195 Cubans received immigrant visas, official figures show. Asked if the Trump administration would do anything to address the U.S. failure to uphold the migration accord, a State Department spokesman said the agency is still offering visa interviews to Cubans — but only if they can afford a trip to the U.S. Embassy in Georgetown, Guyana. Cubans and Cuban-Americans have complained bitterly that the arrangement is an often-insurmountable obstacle for people whose average government wage is little more than $30 a month. Sen. Marco Rubio of Florida, who has pushed for the Trump administration’s confrontational policies toward Cuba and supported the diplomats’ withdrawal, declined through a spokeswoman to address questions about the negative impact of the pullout on Cuban activists, small businesspeople and his own Cuban-American constituents. Since Pompeo replaced Tillerson at the State Department in April, officials said, he has taken a much more active stance on the Havana mystery, establishing the task force and strengthening the investigation. The wider effort has brought in further resources from the Centers for Disease Control and Prevention, the National Institutes of Health, the Department of Defense and the Department of Energy, among others. Technologists from the Department of Defense and other agencies have also stepped up efforts to try to determine what kind of previously unknown weapon could have caused the injuries that the diplomats and spies have suffered in Havana. So far, however, those efforts have been unsuccessful. Earlier this year, officials said, some scientists made a case for microwave radiation as a possible explanation. Russia had experimented with the technology for decades, going back to the Soviets’ use of microwave energy to conduct surveillance on the U.S. Embassy in Moscow starting in the 1950s. It is also known to be capable of producing the sensation of sound as part of what is called the Frey effect. But other scientists are highly skeptical of the microwave hypothesis. In part, this is because many consider the dangers of low-level, regular microwave exposure from sources like communications towers to be unproven. Officials said the microwave theory has also been discounted by experts who believe microwaves intense enough to damage the brain would have to burn other tissues. Some scientists have suggested electromagnetic-pulse technology, or pulse radiofrequency, or lasers as possible causes. Others have argued that ultrasound or infrasound could have been the “mechanism of injury.” But holes have been poked in all of those theories, officials said, because the physical circumstances of the Havana incidents would have made those technologies difficult to deploy. In a still-classified report prepared late last year, the FBI discounted the possibility that a sonic weapon had been used, officials said. Investigators are continuing to examine whether the diplomats were hurt by malfunctioning electronic-surveillance technology that could have been used by the Cuban security forces. So far, however, no evidence of any such device or technology has been uncovered in searches of the Americans’ Havana homes, officials said. As the list of possibilities dwindles, another question echoes: Is it plausible that a foreign power could secretly develop a weapon so new that American scientists cannot even identify it — and then deploy it covertly and repeatedly, in a highly monitored environment like Havana — and leave no trace at all? James Giordano a neurologist at Georgetown University Medical Center, was recruited by the State Department to try to help determine from the diplomats’ injuries what technology might have been used against them. Giordano acknowledged that it remains unclear even where the primary injury to the patients was located. Giordano, who has studied so-called neuroweapons, said he thought the most likely technological suspect was some form of electromagnetic pulsing or hypersonic energy. Such a device could be shrunk to about the size of a thermostat, he said, but would probably work only within a single room, even if multiple devices were deployed simultaneously to enhance the effect. Some weapons experts have proposed similar scenarios. But officials familiar with the investigation cautioned that those theories must be tested against the physical circumstances mapped out by the FBI: The walls and windows that a weapon would have had to penetrate, the closely watched streets that would have had to be transited, the neighbors who apparently did not hear the loud, piercing sounds. In Giordano’s hypothesis of a miniaturized pulsing device, adversaries would have had to enter single-family homes or hotel rooms in some of the most heavily policed sections of Havana, the capital of what is generally considered a police state. If they removed the devices before they could be found, they would have had to enter each location at least twice. Such a scenario struck current and former intelligence officials as far-fetched. In interviews, those officials questioned whether Russian intelligence operatives, for example, would have the motivation or skill to repeatedly target Americans in Havana without leaving any trail. Russia’s desire to undercut U.S. power in the Western Hemisphere, and its long-standing presence on the island, has made it a suspect among U.S. officials from the beginning. As Washington has scaled back its presence in Cuba, Russia has also moved to expand its economic and security relationship with the island. Russian President Vladimir Putin hosted Díaz-Canel for an official visit last week, promising loans to purchase Russian weapons and ever-stronger strategic ties. Still, Russia would seem to have little reason to monitor the activities of relatively low-level American spies and diplomats in Cuba, former intelligence officials said, and would not likely take the risk of serious, gratuitous attacks on American personnel. National security officials said that despite an extensive search through signals intelligence and other means, they have yet to turn up any information that clearly implicates the Russians, even circumstantially. Several officials specifically disputed the accuracy of a recent news report asserting that secret intercepts of electronic communications had shown the Russians to be “the main suspect” in the Cuba incidents. Although FBI teams have visited Cuba at least six times, their investigation on the ground in Havana has been constrained, officials said. In many cases, agents were only able to see homes, apartments or hotel rooms in which the diplomats were struck long after the fact. Some U.S. officials also said the Cuban government has so far failed to turn over some video surveillance footage the FBI has requested from areas where some of the diplomats lived. For the most part, FBI officials have emphasized the Cuban government’s cooperation with their inquiry. The FBI declined to comment for this article. The Trump administration’s sharpening criticism of Cuba has contrasted with Pompeo’s praise of the Chinese government’s response to the problem at the U.S. consulate in the southern city of Guangzhou. A State Department spokesman would not explain the discrepancy, or specify what actions Cuba had failed to take at Washington’s request to protect U.S. personnel. One case in which the FBI was relatively quick to survey the site of an incident was that of the young woman who heard a noise at her Havana home in late May. Even then, bureau agents were not on the island at the time but arrived about a week later. Officials said the agents found nothing to contradict the Cuban authorities’ conclusion about a loud water pump, and one official said they appeared skeptical that any sort of attack had taken place, notwithstanding the woman’s subsequent diagnosis. Similarly, FBI agents have been unable to find any further link between the Havana cases and the experience of a 31-year-old commercial attaché in Guangzhou, Catherine Werner, who fell ill in the fall of 2017, amid a flurry of news reports about sonic “attacks” in Cuba. The woman’s case is the only one from China that has been linked by State Department doctors to the diplomats in Havana. For months, the State Department vacillated on the matter of whether to describe what happened as “attacks” on the diplomats. CIA officials who initially argued that their colleagues had been deliberately targeted, have backed away from that claim more recently, officials said. But the Trump administration’s public stance has only hardened. Since taking over the State Department, Pompeo has unequivocally described the incidents as attacks and other State officials have quickly fallen into line. The National Security Council staff, which now has a committed opponent of the Cuban regime, Mauricio Claver-Carone, as its senior Latin America policy official, has also ratcheted up the rhetoric, officials said. While some outside specialists have raised questions about whether the diplomats could be victims of some kind of mass psychogenic illness, or “mass hysteria,” doctors who have evaluated the patients or reviewed their records discount that possibility. Over the last several months, some officials have raised questions about the continuing difficulties of some of the Havana patients, including several who said they thought they had been surreptitiously monitored or even followed since returning to the United States. FBI agents have dutifully investigated the alleged incidents, but have been unable to corroborate any of them, officials said. Some medical specialists have also wondered whether some diplomats might have suffered a functional neurological disorder — a disruption of the central nervous system, often triggered by illness or trauma, that can affect the functioning of an organ system even when there is no structural damage. Such disorders include irritable bowel syndrome, fibromyalgia and chronic fatigue. But they can also affect balance and cognition in ways that resemble the difficulties of some of the Havana group. One syndrome raised in response to the Penn doctors’ February report is a functional disorder called persistent postural-perceptual dizziness, or PPPD. That condition, known by the shorthand 3P-D, is characterized by dizziness, vertigo and other neurological impairments. It can be set off by physical trauma, a panic attack or even chronic anxiety. Medical experts including Stone, the University of Edinburgh neurologist, said PPPD would not encompass some of the symptoms reported by the Havana patients, such as headaches, problems with recall or sleep disturbances. But he said the condition can commonly occur alongside migraine headaches or cognitive problems. For months, some of the stricken Havana diplomats felt their condition was not taken as seriously as it should have been amid then-Secretary Tillerson’s chaotic reorganization of the department. The State Department’s administrative and medical bureaucracy was slow to find them further treatment after their Miami assessments, grant them needed leave and even cover their medical bills, officials said. As they grew more concerned, some of the Havana patients took matters into their own hands. Early on, they enlisted representatives of the foreign-service officers union to advocate for them with the department. Some have also met with Cuban-American and other members of Congress, who have been vocal in their defense. Some patients also hired a lawyer to represent them. Regardless of how the investigation unfolds, that constellation of forces is likely to give the stricken diplomats some influence over how any conclusions about what happened in Havana. Already, the State Department leadership has been dismissive of the idea that psychological factors could have been part of the medical equation.